This is the first quest in Conker’s Bad Fur Day and it sets the tone for the rest of the game. You’ve got an addict scarecrow, a drunken squirrel and an obese foul mouth gargoyle. I couldn’t think of a better trio to welcome you into this amazing Rareware title. After Conker awakens from his drunken stupor, to a hangover we’ve all experienced at least once in our life, you’ll need to slowly wobble your way around the fence, through the fence grate and over to Birdy the Scarecrow. Once you make your way to Birdy there will be a cutscene where Birdy explains the context sensitive B buttons that play an enormous part in this game. After the scene ends, head on over to the context sensitive B button outside the fence and press B on it. Conker will pop a couple alka-seltzers into a glass of water and his hangover will be cured!! Now that you’re hang over free, wade through the water to that little patch of land near the waterfall. Once you get there Conker will remember he has a special high jump and tail spin that you can use to get to the ledge above. Jump all the way up the side of the ledge using the small cliffs protruding from it until you get up to the bridge with the gargoyle. Once you get to the bridge turn around so you can jump up and grab the lever behind you. After you pull the lever a door that you passed on the way up the cliff will open. Proceed back down the mountain side and enter into the door. Once you enter the door, it will lock behind you and the key to open it will be bouncing around to escape your clutches. 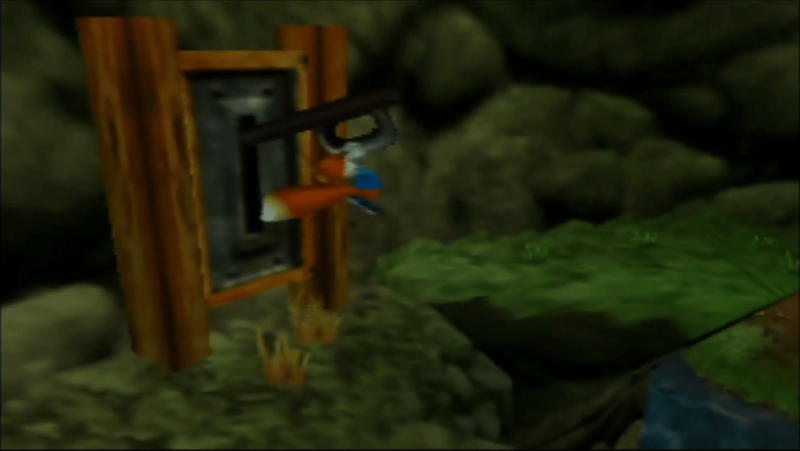 Luckily Conker remembers, after trying to catch the key for several seconds, that he has a frying pan on him. Use that frying pan to knock out the key. After knocking it out, pick it up and proceed to unlock the door in front of you. Make your way back up the mountain side to the gargoyle’s bridge. When you try to cross the bridge the gargoyle will deny you stating that you can’t cross the bridge because, “he’s only just gotten comfy”. After the cutscene is over, run up to him and use the B button to smack him with your new frying pan. 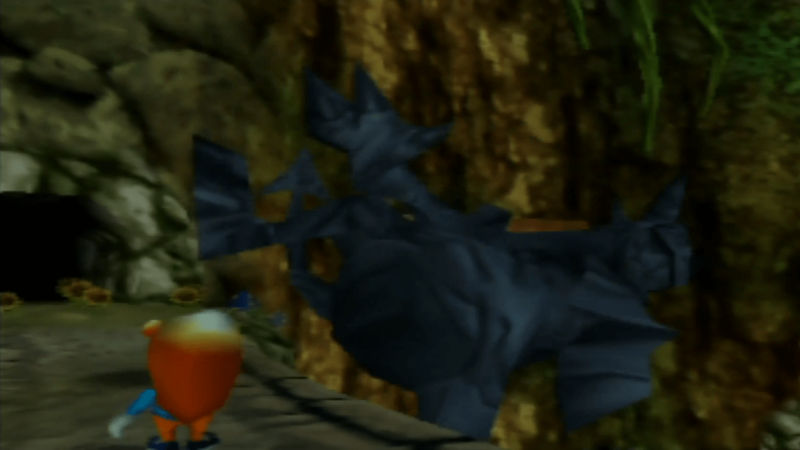 After hitting him another cutscene will occur where the gargoyle loses his balance, falls off the cliff and due to his pro level obesity game causes a rockslide to occur, which of course blocks Conker’s only exit from the area. 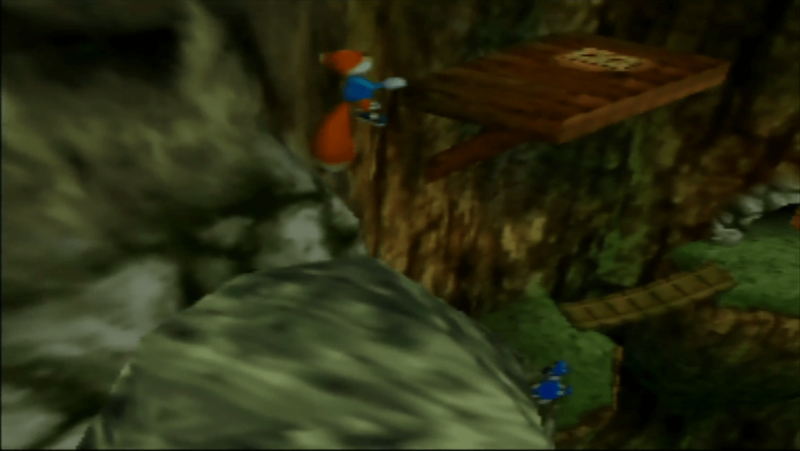 Jump on top of the boulder that is blocking Conker’s exit from the area and jump over to a ledge on the right. When you successfully make it to the ledge you will find a context sensitive button on it. Press B on the context sensitive button and Conker will pull out some dynamite that will blow that boulder away. Now that the rock is gone, jump off the ledge and exit this area!